Bat bugs are parasites that live and feed on the native bats in our area. Similar to the way that fleas live and feed on dogs. 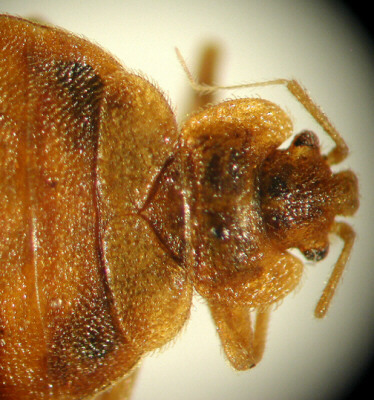 Bat bugs are very similar to bed bugs and it takes a very trained eye and a microscope to tell them apart. 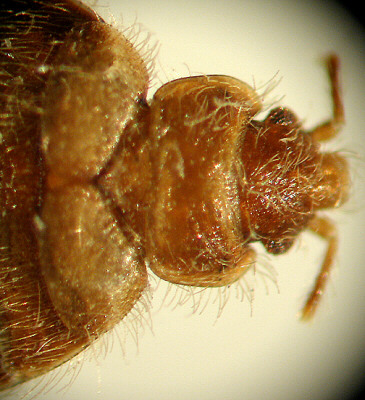 We typically find bat bugs in attics and other areas where large colonies of bats reside. A large pile of bat guano under a bat roost in an attic will usually be crawling with bat bugs. When you shine a flashlight on the pile of bat guano, it looks as if it’s alive and moving from all the bugs crawling through it. Bat bugs are bloodsucking insects and usually feed on the blood from bats. However if bats are not available they will attach themselves to other animals including humans. Bat bug infestations must be handled very carefully to avoid disastrous problems. If bats are excluded from an attic and the bat bugs are left behind. They will often drop down into the living space of the house while looking for a new host. In this situation the homeowner ends up with hundreds (if not thousands) of bed bugs crawling throughout their home. In some cases it can be more difficult to get rid of the bat bugs than the bats. ALWAYS bring in a professional pest control company that has experience in eliminating bat bugs when you have this type of problem. If you have a severe bat infestation or you are encountering bat bugs in your home or attic, it is very important that proper inspection techniques and exclusion methods be utilized. Call a professional today! After the bats have been removed and the area has been cleaned and the exclusion work is complete, the next step is to repair the damage that was caused. Because of their environmental value, many pest companies recommend controlling bee populations rather than exterminating them. You can prevent a wood-burrowing species from damaging your home or establishing a colony in a dangerous area by applying bee repellents. Other repellents can be sprayed near areas where bees already exist, but you should be cautious. Not only is this method dangerous for one who is unprotected, it is dangerous for others. The bees may simply swarm to a neighbor’s home, rather than to a safer place. While you can buy and use chemicals for bee extermination or control, you need to keep in mind that they can be quite dangerous. It is critical for you to take proper precautions and cover yourself from head to toe. A particularly dangerous or severe bee infestation may call for extermination. Those who are allergic to bees should forgo do-it-yourself extermination and hire a professional. Those with pets or small children who could be adversely affected by these chemicals might also consider hiring a professional. There are specific bee and wasp pest control methods that a professional can help you with. Hiring a professional pest control can mean safe and efficient handling of the wasps and bees. According to Pest Control Experts, there are several bee species. While most people envision bumblebees, that is to say bees swarming around a hive, many bees actually live in burrows. Some burrow into wood. Wasps, like bumblebees, create colonies. Wasps are particularly dangerous because while a common bee can only sting once, wasps can sting several times. While there have been instances where wood-burrowing species have damaged homes, most prefer the rotting wood of trees. Bees who develop hives can still cause great damage to one’s home should they find a means of establishing a hive within the structure, such as within a wall. In such instances there is some risk that the weight of the honey produced can actually cause drywall to crumble, subjecting residents to a swarm of angry bees. This is also very rare. Most colonies can be identified by a number of protective males swarming about the area, though some may be more difficult to pinpoint. Ridding your home of animals or pests is the first step in home repair. Next is finding a company who can repair damages. Hiring a professional pest control can mean safe and efficient handling of the wasps and bees. A professional can handle your entire problem from start to finish, including pest control or animal removal, and the repair of damages that may have occurred. Have you noticed there are increasing amounts of bees or wasps near your property? If so, you should check the outside of your home and property for a hive. While bees play a crucial role in pollination, pest control and honey production, they can also harm people, pets and property. Bees play an important role in nature. They pollinate plant and flower life, control other pests and produce honey. However, they can also sting. While a few rogue bees in your back yard now and again is certainly not cause for alarm, a swarm of them living in a playground, near a home entrance or other area where one is likely to be stung is. Irritated worker bees can pursue what they sense is an intruder, which at best can lead to a few painful stings and at worst to death. While this is rare, it is certainly a concern. While you can buy and use chemicals for bee extermination or control, you need to keep in mind that they can be quite dangerous. It is critical for you to take proper precautions and cover yourself from head to toe. Those who are allergic to bees should forgo do-it-yourself extermination and hire a professional. Those with pets or small children who could be adversely affected by these chemicals might also consider hiring a professional. There are specific bee and wasp pest control methods that a professional can help you with. Hiring a professional pest control can mean safe and efficient handling of the wasps and bees. Allergic reactions to stings, can develop anywhere on the body and can range from non-life-threatening reactions, such as hives, swelling, nausea, vomiting, abdominal cramps, and headaches to life-threatening reactions, such as anaphylactic shock, unconsciousness, difficulty breathing, and blockage of the airway. Anaphylaxis is a severe allergic reaction to a bee or wasp sting that affects a limited portion of the population (one or two out of every 1,000 people). For these people, being stung by a bee or a wasp may be life threatening. While fewer than 100 fatal reactions to sting venom are reported annually in the U.S., it is imperative that if it’s suspected that someone is allergic to sting venom, they be examined by a medical provider. A medical provider may prescribe either a “sting kit” which includes epinephrine (adrenaline) loaded in a hypodermic syringe for injection, or an Epi-Pen which is an auto-injector loaded with epinephrine. The best time of the year to control wasps is in June after the queen has established her colony and while the colony is still small. The first step in bees and wasp control is to correctly identify the insect and locate its nesting site. Getting rid of these pests can sometimes be fearful, especially if you are allergic. A large nest may mean an attack and stings on you or other people in the area. Hiring a professional pest control can mean safe and efficient handling of the wasps and bees. 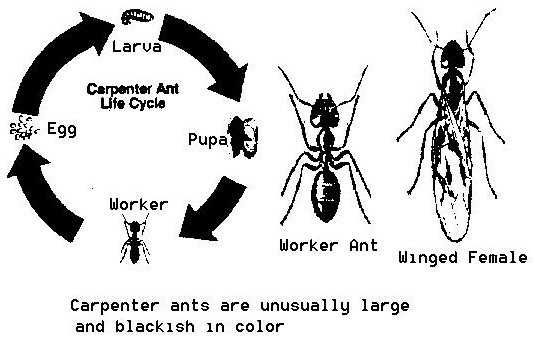 Pest control experts are trained in handling these stinging pests and we can rid your home or business quickly using nontoxic organic products.